Presented to the Club, School or University scoring the highest number of points (open to all). Presented to the visiting Club, School or University scoring the highest number of points in non-Junior events. Presented to the visiting Club, School or University scoring the highest number of points in all Junior events. One point will be awarded per rowing seat per race win. 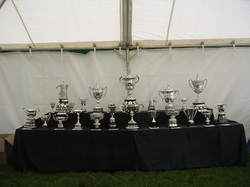 The Visitors' Victor Ludorum Trophies are not open to Chester Clubs.